Who were the Top Roto Hitters in May? 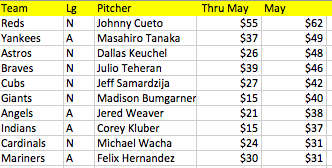 Who were the Top Roto Pitchers in May? Lots of power hitters had a great May, but so did surprise hot start speed guy Dee Gordon. Is anybody else surprised to see Dallas Keuchel near the top of this list? Thru May = The year’s earnings through May 31st. May = May earnings only. These earnings are scaled based on the whole year budget. If you want to know what the actual earnings on year is, divide the Thru May number by three. All Players start with a -$4 opportunity cost. That’s what it would cost you to keep a slot empty all year. For players with lots of playing time, this makes the numbers more accurate, it but explains why someone like Oscar Taveras, who hit a homer in his first game, has a negative value for the month. It certainly didn’t help Aaron Brooks, who managed to lose $21 in just two appearances. The spreadsheet with all the players who played in April and May is right here.